Bootable backup allows you restoring a bootable system image, such as Windows 10, Windows XP or Linux, to an empty hard drive. As a bootable backup software, Handy Backup creates bootable, restorable images of Windows and Linux partitions, and contains a utility to install these images from scratch. Our software is equipped with a Disaster Recovery module which lets you create a bootable backup drive and use it to restore your PC after a crash. It has multiple first-aid functions and is fully compatible with backups made in Windows. Please contact us to obtain a copy of a Disaster Recovery utility. Backing up your HDD and restoring it to a different device is an easy way to clone all the information on your hard drive. You can clone your disk either when you running the program under Windows or when you installing a system on some PC from a bootable recovery drive. Unlike many other bootable backup software, the program allows you backing up system drive without stopping Windows. Complete computer backup can be performed in a "hot" mode (without a reboot), and does not interfere with your work at all. To back up bootable disks and make use of the recovery drive, you need the Professional edition, or higher. Free 30-days trial version! Bootable backup for PC running under Windows (such as Windows 8 or XP) is a rough equivalent of an Apple Time Machine. It can snapshot and restore a current state of your system drive, just like Time Machine do it for Macs. 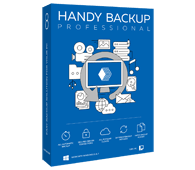 Add to this option a high versatility of Handy Backup, and you will feel a perfect security for your system! It is highly recommended to create at least one bootable backup Windows drive, because if your primary system crashes, you will not be able to launch the system to restore your backups. Besides that, you can create a copy of your system using Handy Backup as the perfect bootable backup software, just for a case. Bootable Backup with Handy Backup Disaster Recovery - great help in case of emergency! Our software allows you to easily create a bootable disk backup, as it was an ordinary “cold” external media. It features a Disaster Recovery module designed for creating backup images and disaster recovery disks. In case of a system crash, you can use a recovery drive to boot from it and restore a backup either to the original, or to a different place. This means that even if you can’t boot your main system, you will be able to launch your PC and restore your data in working state. The program can restore images on the original disk, or to a different hard drive, resulting in a HDD clone. All backup operations can be done from Windows, except restoring system partition and other locked partitions, which require you to boot from a recovery flash or USB drive (which contains a Linux-based operating system).